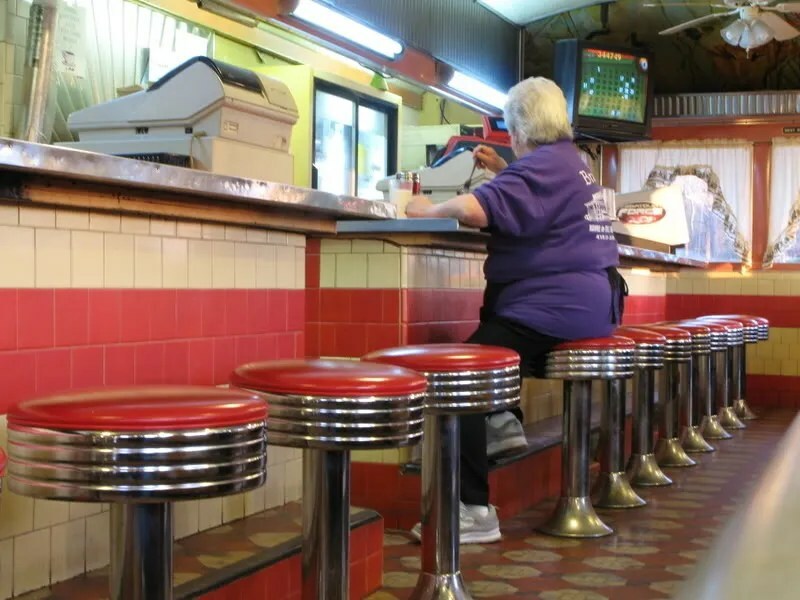 Here’s another one of the Maryland Diners. It’s changed a bit since it was built. Take a look at the postcard and take a look at what it looks like now. Here’s how it looked when it was new, probably late 1930s. The tag is gone, it was probably removed or covered over when renovations were done in the 1950s. It was called the New bridge diner then. I like the awnings. A nice touch of class. A shot showing the old mural painted on the ceiling. There is one on both end, both with similar scenes. This also shows the ’50s renovation, with boomerang formica replacing the dark wood window surrounds, a stainless bump out for lighting fixtures, and the end door delete. 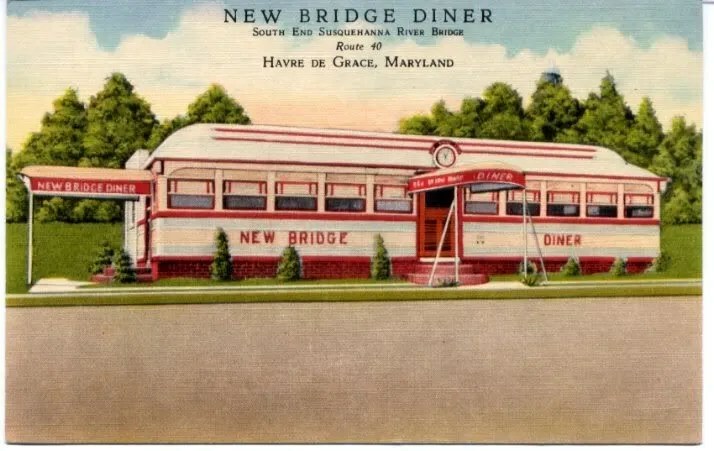 This entry was posted in Diners / roadside related, Diners/ restaurants, Roadside attraction, Silk City and tagged 1930s, 1950s, Aberdeen Proving Grounds, Bridge Diner, diner, formica, Havre De Grace, Havre De Grace Maryland, Maryland, MD, Pulaski Highway, Rt. 40, Susquehanna River Bridge by Spencer Stewart. Bookmark the permalink. 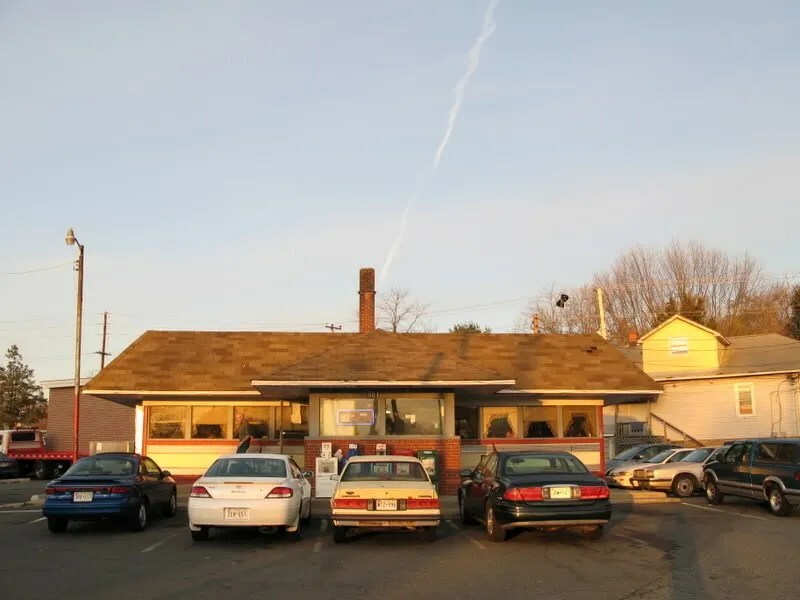 Spencer, this is one diner I have passed by more than once over the years on the way north. I actually ate there in 1987, but I never took a photo of it unfortunately. Looks like the bridge has been unfortunately remodeled within the last year. 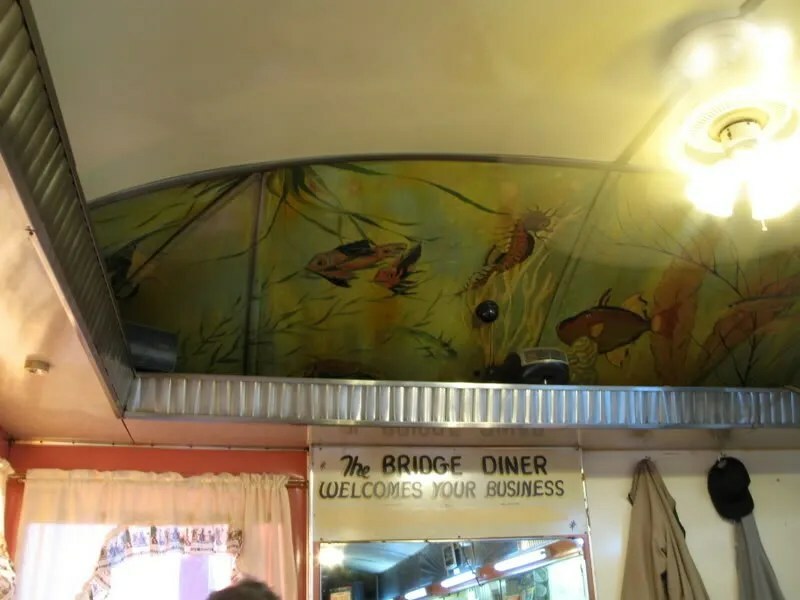 WOULD YOU PLEASE CONTACT ME BY EMAIL SO I CAN ASK YOU A FEW QUESTIONS ABOUT BRIDGE DINER. Hello Christina, I am sorry to hear about the diner closing! I live in Los Angeles and I believe I have found a family member named Clarence that wants to get back in touch with the family. Please email me if you can.